Ayrat Khamzin and Almaz Nasybullin published a paper in Physical Chemistry Chemical Physics. The researchers are working on a theory of relaxation of hexagonal ice. The core of the theory is that any dielectric, including ice, can be polarized when placed in a magnetic field, which means that electrical charges are moving within that field. After the field is removed, dielectric relaxation – gradual diminishing of polarization – occurs. Changes in dielectric polarization of ice under different temperatures can be good indicators of the presence of various inclusions and thus of the purity and quality of water and ice. Spectroscopy is widely used for studies of physical and chemical properties of materials and compounds. However, it had not been used for ice research before the paper saw light because there was a problem of explaining dielectric spectrum changes of ice under various temperatures. 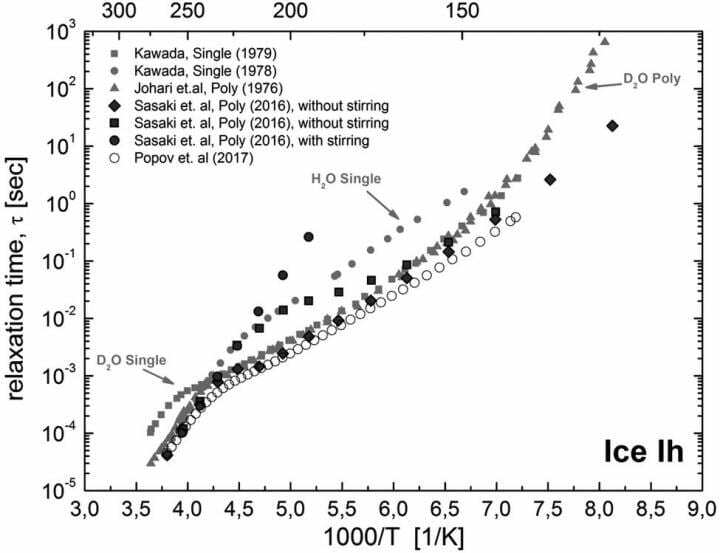 In cooperation with Dielectric Spectroscopy Lab (Hebrew University of Jerusalem), Khamzin and Nasybullin perfected the phenomenological model of relaxation, which helped explain the non-Arrhenius behavior of the temperature dependence of the ice relaxation time at temperatures below 155 K.
Dr. Khamzin comments, "This theory of electric polarization of water in its different phases is necessary to interpret information obtained from experimental dielectric spectra. Data about dielectric permittivity help create and test spectroscopic model of soils and rocks and study relaxation processes in them. For instance, in order to study soils with radio wave devices you need to know their dielectric properties. They are different for different types of soils, which is determined mostly by the ratio of bound water in them and its characteristics."